[132 Pages Report] The global Endpoint Security Market size was USD 11.62 Billion in 2015 and is projected to reach USD 17.38 Billion by 2020, growing at a Compound Annual Growth Rate (CAGR) of 8.4% during the forecast period. The endpoint security market size is estimated to grow from USD 11.62 Billion in 2015 to USD 17.38 Billion by 2020, at an estimated Compound Annual Growth Rate (CAGR) of 8.4% from 2015 to 2020. Endpoint security is a policy-based security approach to protect enterprise network when accessed via endpoint devices, such as smartphones, tablets, desktops, laptops and other remote devices. The report aims at estimating the market size and future growth potential of market across different segments, such as solutions, services, deployment type, organization size, verticals, and regions. The base year considered for the study is 2014 and the market size is forecasted from 2015 to 2020. With the rise in Bring Your Own Device (BYOD) trend in SMBs and enterprises, the endpoint device control solution is expected to play a key role in fueling the growth of the market in the next five years. The endpoint security market ecosystem comprises security solution vendors, such as Symantec, Intel Security, AVG Technologies, and ESET; security service providers, such as Bit9 and Fortinet; system integrators, such as Knowledge Consulting Group and Space Hellas S.A., and various consulting firms like Accenture, Deloitte, and Ernst & Young who sell these endpoint security solutions to end users to cater to their unique business requirements and security needs. MarketsandMarkets forecast the endpoint security market size to grow from USD 11.62 Billion in 2015 to USD 17.38 Billion by 2020, at a Compound Annual Growth Rate (CAGR) of 8.4% from 2015 to 2020. The growing number of enterprise endpoints and consumer devices and access to critical data are creating a huge demand for endpoint security solutions across the world. The major factors driving the growth of the market is the need to mitigate IT security risks, growing BYOD trends among organization and increase in the frequency of endpoint attacks. Furthermore, due to rise in the demand for integrated endpoint security solutions and increasing adoption of cloud-based security solutions, the market finds huge opportunity to proliferate in the next five years. The scope of this report covers the endpoint security market by solution, service, deployment type, organization size, vertical, and region. Anti-virus solution is expected to have the largest market share and is projected to dominate the market from 2015 to 2020, due to growing demand for mobile and tablet anti-virus security solutions. 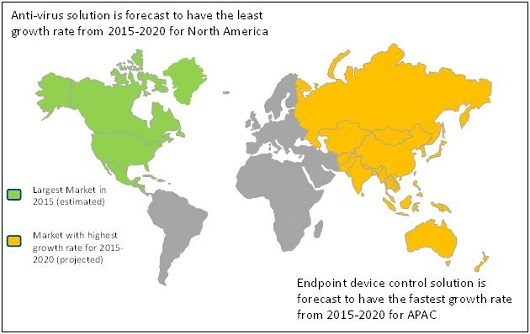 Endpoint device control solution is expected to play a key role in changing the endpoint security landscape and will grow at the highest growth rate during the forecast period as Bring Your Own Device (BYOD) adoption in enterprises will continue to grow. Managed security services would dominate the market and expected to contribute the largest market share, whereas training and support services would grow at the highest rate during the forecast period. Cloud-based endpoint security solutions are expected to gain traction in the next five years, as it benefits organizations with increased scalability, performance, 24/7 service and enhanced endpoint security. The endpoint security solutions are being increasingly adopted in various verticals, such as government and defense, Banking, Financial Services, and Insurance (BFSI), and healthcare, which have led to the growth of the market across the globe. The BFSI sector is expected to grow with the highest rate from 2015 to 2020, in the endpoint security market. The market is also projected to witness growth in the healthcare and IT and Telecom sectors during the forecast period. North America is expected to have the largest market share and dominate the endpoint security market from 2015 to 2020, due to presence of large number of security vendors. APAC offers potential growth opportunities, as there is rise in BYOD adoption among SMBs and enterprises that are turning towards endpoint security solutions to defend against potential threats. Availability of free endpoint security solution and lack of internal threats targeting endpoints are restraining the growth of the market. Organizations are exposed to serious risks as there are too many entry points for potential threats to attack and lack of knowledge about internal threats. The major vendors in the market include Symantec Corporation, Intel Security, Trend Micro, Sophos, and Kaspersky Labs along with others. These players adopted various strategies such as new product developments, mergers, partnerships, collaborations and business expansion to cater to the needs of the endpoint security market.